Introducing the world's first truly hybrid electric OR battery powered winter weather snow shovel. Declare your independence from the grid and go offline. Snow Joe's exclusive hybrid technology allows you to quickly and easily switch from powered when you need it- to unplugged when you don't- to blast your way past the limits of the extension cord and dare to go where no electric has gone before. A dusting on the deck, the powerful 40V 4.0 Ah battery is great for a quick sweep or for those areas where the cord won't cut it. Drop it in and go. More snow in the driveway, simply plugs it in, turn it on and dig out. The only real difficulty you'll have is deciding whether to choose battery or electric. Best of all, hybrid technology means never having to run out of power, or options, when winter strikes. Exercise your freedom of choice. Make the switch to hybrid. ON8024-XRP's ground-breaking, rechargeable 80-Volt power plant and powerful 2500 W brushless motor has what it takes to weather winters worst, featuring two interchangeable EcoSharp 40V 6 Ah batteries to deliver up to 30 minutes of GAS-FREE and CORD-FREE no-fade performance, with zero carbon emissions for cleaner air.iON8024-XRP starts instantly with a simple push of the illuminated display, to put the legendary power of iON at your fingertips for unparalleled snow-shredding performance, courtesy of its cutting-edge 4-speed digital drive system. And iON's integrated illuminated battery indicators mean you'll never be left in the dark when it comes to having the information you need close at hand.Equipped with a 2-stage heavy-duty serrated steel auger and powerful impeller, iON8024-XR plows through up to 1000 pounds of snow per minute, clearing a path 24-inches wide by 13-inches deep in a single pass. 13-inch 40V Hybrid Cordless Electric Snow Shovel Introducing the world's first truly hybrid electric OR battery powered winter weather snow shovel. Declare your independence from the grid and go offline. Snow Joe's exclusive hybrid technology allows you to quickly and easily switch from powered when you need it- to unplugged when you don't- to blast your way past the limits of the extension cord and dare to go where no electric has gone before. A dusting on the deck, the powerful 40V 4.0 Ah battery is great for a quick sweep or for those areas where the cord won't cut it. Drop it in and go. More snow in the driveway, simply plugs it in, turn it on and dig out. The only real difficulty you'll have is deciding whether to choose battery or electric. Best of all, hybrid technology means never having to run out of power, or options, when winter strikes. Exercise your freedom of choice. Make the switch to hybrid. 13-inch 40V Hybrid Cordless Electric Snow Shovel is rated 3.8 out of 5 by 54. Rated 3 out of 5 by Lambchop from When it works The Snow Joe does a great job of clearing snow. The problem I have is it only runs for 30 seconds or so when using the battery. Let it rest for 10 seconds and get another 30. When using it corded it runs fine. Rated 3 out of 5 by DaveO from Good product with a design flaw I like this product - it is powerful and the battery life is good. However, the auger is made of cheap plastic and is flimsy, so if you hit anything,the augur will break. If the augur was made of a more flexible and impact-resistant plastic, this product would be a home run. Rated 4 out of 5 by Xxxxx from Have only been able to use it on wet heavy... Have only been able to use it on wet heavy snow and it did better than expected, so I expect it to preform great with fluffy snow. The only downside is it’s heavier than I expected. At only 15lbs I didn’t expect it to be hard to manage but i just put more power behind it. Rated 4 out of 5 by MichMan57 from Pretty impressed I have to tell you I was a bit leary about buying this but I can tell you I just used it for the first time today and it worked awesome! We had about 6” of snow today and it worked through it quite well. Cleared off the deck and front sidewalk with ease. I was also impressed how far it threw the snow. It won’t get all the way down to the concrete but it gets close enough. Rated 2 out of 5 by TickTock from Snow Joe Hybrid Power Shovel The shovel is a great idea but has some design flaws. The snow blows back on you and you get covered in snow. It should have an attachment that allows you to direct the path of the snow. Rated 5 out of 5 by Tom L from Great Finally got to use it on a 9" snow! Worked as described. One my best purchases EVER!!!! 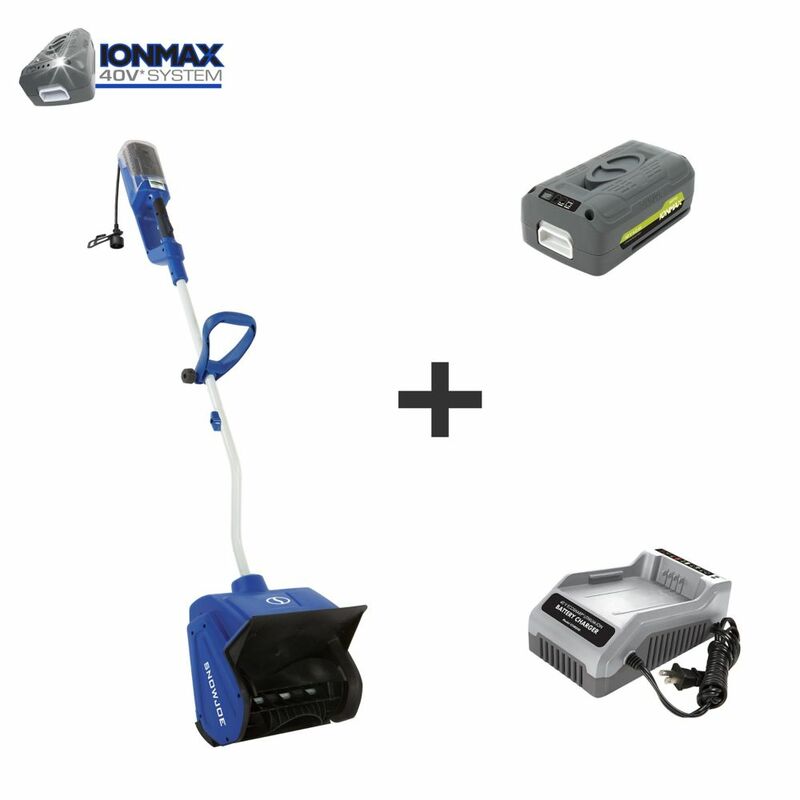 Is Snow Joe 10 Amp Electric Snow Shovel and 40v Hybrid cordless/Electric Cordless got same power? Is snow blower comes with battery pack?